Despite a fifth round stumble against Alec Getz, Evan Ju continues to impress at the Cadet Championship (June 17-21, Tampa), leading by 1.5 points with 5/6. In the Junior Invitational, held concurrently, Marc Arnold and Mackenzie Molner still lead by the narrowest of margins, with 3.5/5. The fifth round of the Juniors saw a face-off between the two highest rated players in the event, Ray Robson and Elliott Liu. Ray aggressively attacked against Elliot's Liu modern defense to win the game. Now Ray is only half a point behind the leaders, making him a serious contender to win the title. In the Cadets, Evan Ju lost in round five to Alec Getz but composed himself and his leading position in the standings with a sixth round victory over Robert Lau. Evan Ju played into a theoretical line of the French Defense Tarrasch Variation, starting with 16.Bxh7+. The game transformed into a rook and pawn vs. two pieces endgame, that should be pretty even. 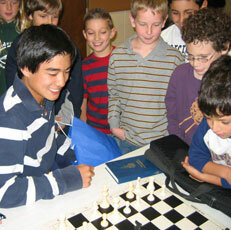 However, Evan proved to understand the position better and penetrated with his rook, pawn and king.